Many people around the world enjoy paper rolling - more and more all the time it seems - consequently there's a long list of quillers whose work I admire. One such person is Victoria Brewer of VBPureDesigns in England. She is known for perfectly constructed Christmas ornaments with gilded accents that sparkle on the tree. Recently Victoria developed a new line of ornaments made with an unusual, but pretty color combination. 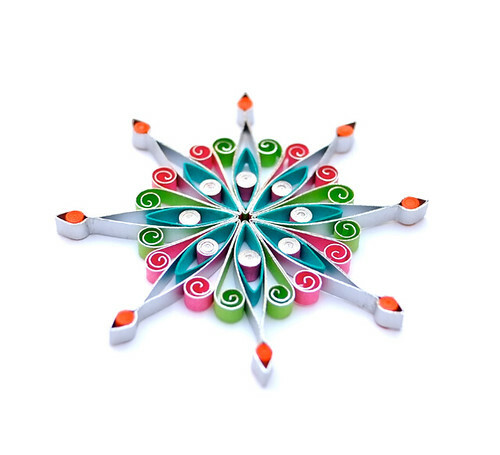 Move over traditional red and green... orange, pink, turquoise, lime green, and silver are jockeying for position! I admire Victoria's flawless technique, in fact, it's so precise I was curious about the type of quilling tool she uses, so wrote to ask and was surprised by her answer - she doesn't use one! We chatted back and forth... Victoria has lots of good advice so I compiled our conversations into an interview - settle in with a cup of tea and enjoy. 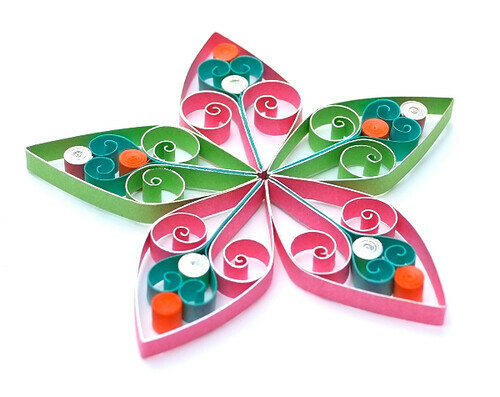 How did you begin quilling and have you been doing it for a long time? 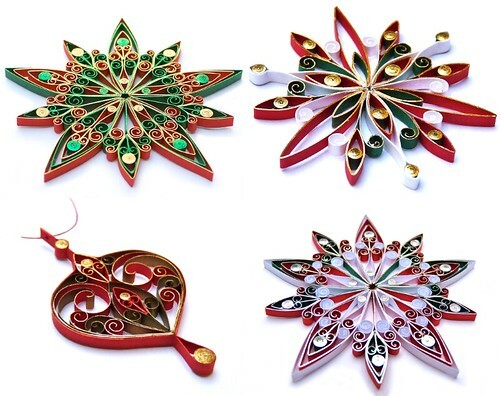 I have always loved working with paper, and as a child I devoured origami books, but didn't actually start working with quilling paper until autumn 2011 when I began playing around with ideas for eco-friendly Christmas decorations. This was inspired by my lack of enthusiasm over mass-made plastic baubles I'd seen in a shop. I stood in front of them thinking in a few years when these colours and designs go out of fashion, these will be lying in landfill and they'll probably still be there in 100 years time! Not surprisingly, Victoria chooses her materials carefully... glue is natural latex combined with dammar (a plant resin derived from the meranti tree, grown in sustainably managed forests in Sumatra), rosemary, and orange oil. She applies eco-matte varnish and uses organic cotton thread for the hanging loop. 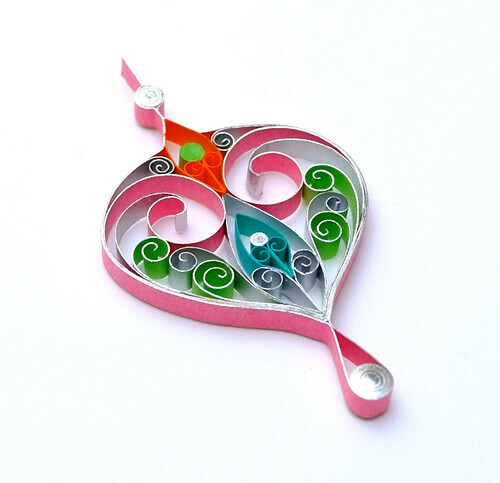 What drew you to quilling and what do you most enjoy about the process? 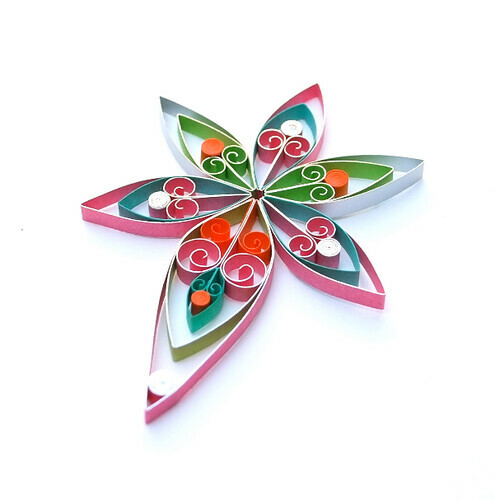 Three things were probably the prime motivators for beginning quilling over any other craft: the eco aspect, the great range of colours, and the cost. The thing that I find most enjoyable about quilling, other than the act of creating, is photographing the items afterwards and seeing the results. It often leads me to view a piece at an angle I might not have seen otherwise, and often inspires and informs my next project. I don't use many tools in my work; all my coils and shapes are made freehand. 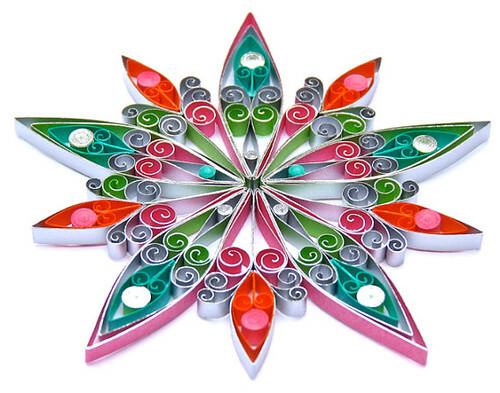 I do occasionally use a quilling board, which in my case is an upcycled polystyrene ceiling tile, though only for large art pieces and almost never for decorations or earrings. My desk usually features tweezers, a small pair of scissors, and cocktail sticks for applying glue. 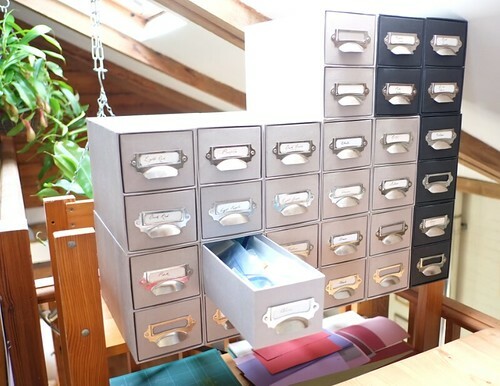 Do you have any organizational tips to share? I definitely wouldn't be without my cardboard storage drawers. These are just the right length for keeping quilling paper flat. Nothing is more frustrating or wasteful than finding squashed or twisted papers! From your Facebook posts, I know you enjoy gardening which I'm sure provides a nice balance with the close work of quilling. What else do you like to do? My other interests are tai chi and alternative diet/therapies. My previous job was as a holistic therapist, working with back pain sufferers, so all these activities really help when I've been sitting at my work desk for too long. I feel it is very important to have at least one day each week entirely away from the desk. I've noticed that rolling coils by hand stresses my thumb and index finger. Do you have any tips on caring for hands? I always massage my hands in the morning with a special oil I blended - mainly rosemary, ginger, and sesame oil, all of which help to warm the joints and increase circulation. I know quite a good tension release hand massage routine, again from my previous work. My husband is a tai chi instructor and has taught me a method called pulsing, which basically lengthens the muscles and tendons to keep space in the joints. Then, before bed, I often use a Chinese cooling oil called white flower oil, which reduces any inflammation. The beautiful lavender wands you make are new to me. They aren't quilled, but the woven ribbons remind me of quilling paper. 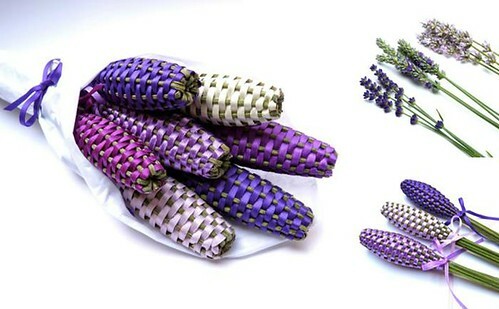 Are they something that is traditionally made with lavender or are they another of your original designs? They're actually a very old traditional craft, originating in France I believe, though I only came across them myself about three years ago. I love lavender and have a garden full; about nine different varieties. My husband is from Bermuda and my mother-in-law loves lavender too, but cannot grow it there, so one summer I thought I'd take her some in the form of a lavender bag or something similar. Looking around on the internet for inspiration I came across a tutorial on YouTube and ended up making a small bouquet for her. They were so popular with friends and family that I was soon getting orders. They can only be made with fresh lavender so the making season is a short one, but it does make a lovely change from quilling for a month or so, and of course my craft room smells heavenly! I have so many ideas, my notebooks are bursting: new jewellery ranges, framed typographic pieces, and a wildlife series, to name a few. But commissions and orders have kept me so busy this year that I doubt I shall be able to work on any new designs until 2015. My Christmas order book is already nearly full! In fact, I'm already thinking of closing my shops for two months in the new year, just to give myself space to do something new. Victoria is accepting Christmas orders through October 31via her Etsy and Folksy shops, as well as Facebook. 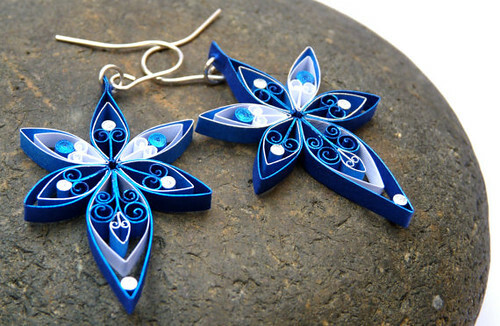 I love her designs and have ordered her lavender, it IS heavenly! I placed the bouquet on my nightstand, it's scent is relaxing to me. So would I, Steffi, they would look beautiful on the tree! Surprising to know she uses no tool at all. Her scrolls are perfect. And how well she stores her paper strips! Thank you for this lovely interview! I have admired Victoria's work for some time but didn't know it. Wonderful to put a name with the work. You're welcome, Fiona, thanks for visiting!